With already more than 200 volunteers, the grassroots Vote Spear campaign is answering the big-business-backed Frank Chopp by building a massive doorknocking campaign and team of neighborhood coordinators across Seattle’s 43rd District. It’s clear that Washington’s Democratic Party establishment has consciously chosen the Spear campaign as the ground on which to launch its counteroffensive against Socialist Alternative’s growing influence. With maximum donations from a long list of corporate sponsors, Chopp has already spent more than $100,000 and carpeted the district with four mailers. The local Democratic Party machine has fully awakened to the threat represented by Sawant and Spear and wants nothing more than to halt the exposure of their blatant big business policies. Housing and education funding remain the central issues faced by working people in the 43rd. The clear demands of the campaign have already had an enormous impact. Chopp publicly professed support for lifting the state ban on rent control, declared a newfound interest in taxing the wealthy, and sought to portray himself as a community activist in the mold of his opponent. But his attempts ring hollow when stacked up against his record. After 12 years with Chopp as House Speaker, the state now suffers as the eighth worst on affordable housing, fourth worst on class sizes, and dead last with the most regressive tax system in the nation. More than $10 billion have been cut from social services, while an average of $6 billion annually were doled out in corporate handouts. After a low turnout in the primary, the general election is a whole new race, with a more diverse and working-class electorate. 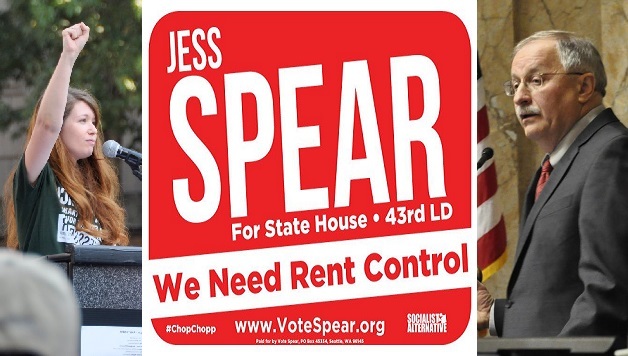 In the weeks remaining, Socialist Alternative’s campaign will shine a spotlight on Chopp’s corporate pork-belly politics and gutting of social services, and offer voters the choice of a real working-class fighter in Jess Spear.